No matter how organized a person may be, there are always meetings, appointments or other important get-togethers that invariably slip through the cracks. That’s why the daily appointment calendar template is perfect for anyone looking for a little extra help to stay on top of things. The daily appointment calendar template can help you organize your day in an easy and efficient way. The template also won’t cost you a cent, as it is instantly downloadable and completely free compliments of MyExcelTemplates.com. As designed, the daily appointment calendar template begins at 7:00 a.m. and ends at 6:30 p.m. However, because it’s an Excel template, you can customize it to better suit your needs if necessary. If your day doesn’t begin until noon or doesn’t end until midnight, simply edit the time text in the individual cells. The next step in using your appointment calendar template is to describe your appointment next to the corresponding time. For instance, let’s say you have a doctor’s appointment at 10:00 a.m., simply type or write “Doctor’s Appointment” next to 10:00 a.m. for an instant and clear reminder. Next, you can add an important phone number associated with the appointment. With the above example, you can add the number for the doctor’s office in the event you are running late or you are unable to make the appointment. The final step is to add any important notes that may be associated with the appointment. Using the above example, you can add the type of symptoms you’re experiencing or any medications you’re currently taking so you are prepared to answer those questions at your doctor’s appointment. 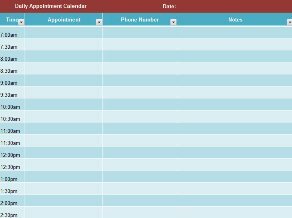 Another great feature of the daily appointment calendar template is that you can organize all your information by time, importance or alphabetically. You can also sort appointments by color, meaning you can place your most important events in red or yellow and move them to the top of the list. When it comes to staying organized and on top of your busy schedule, everyone could use a little extra help. 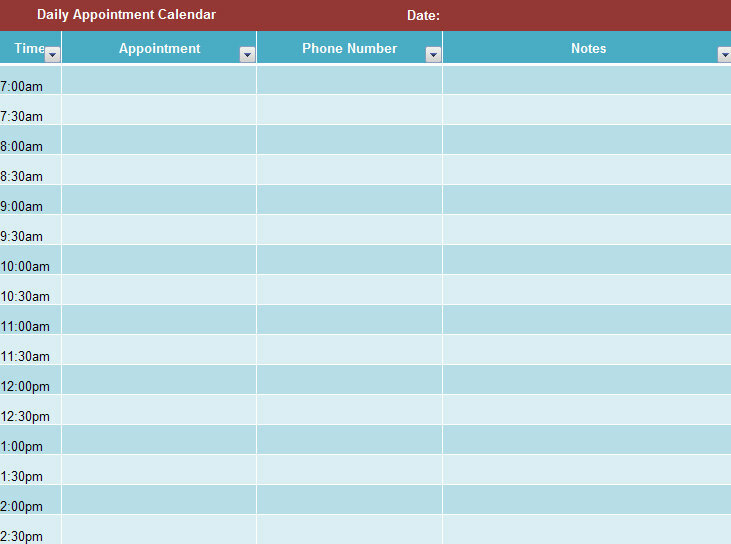 Download the free daily appointment calendar template today and keep things on track.